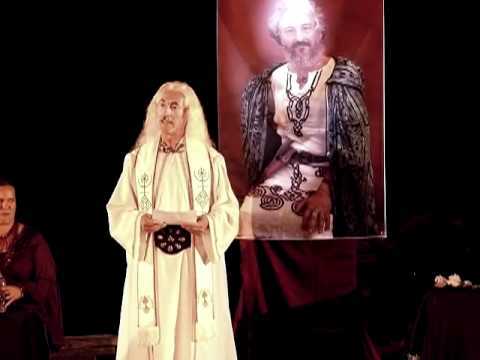 KS – Ár nDraíocht Féin (ADF) has also been translated as “Our Own Magic,” which raises the old question of the difference between magic and religion that has vexed generations of scholars. How much of modern Druidry is based on Wiccan belief and practice? Do you see a great amount of holdovers from earlier influences on modern Celtic spirituality like Theosophy? KT – When I talk about “modern Druidry,” I am talking about ADF. We have consciously shed as much Wiccan stuff as we can. 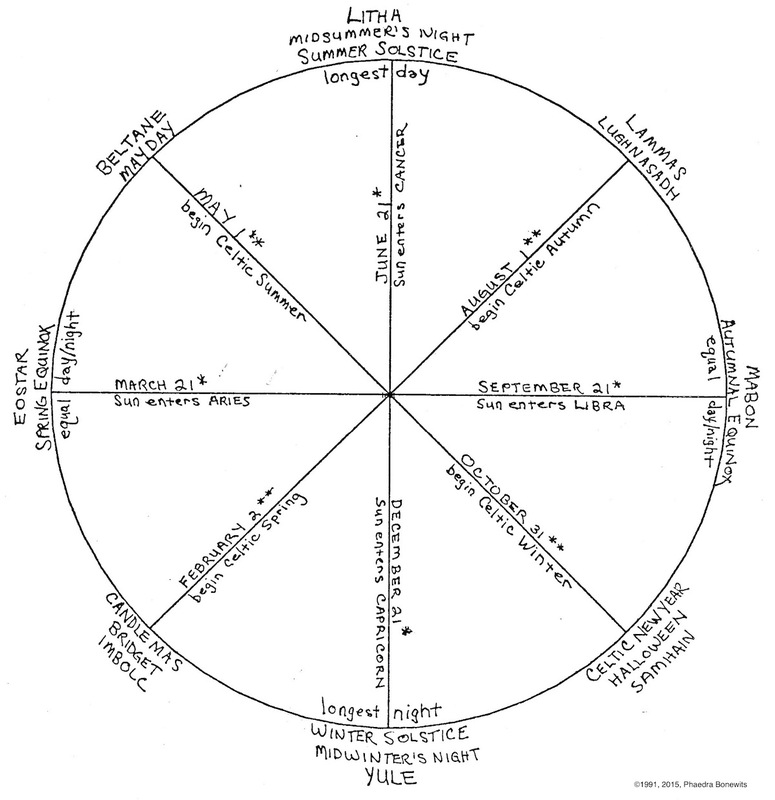 While we have kept the Wiccan Wheel of the Year (sort of) in order to not be too different from the rest of general Paganism, we never cast circles or call quarters in public rites. We also discourage the mixing of deities from different cultures in the same rite, preferring our folks to stick to one culture at a time. As for the Wheel of the Year, we usually don’t use the same names or meanings of the holidays that the rest of Paganism does. If someone is doing a Hellenic rite for a High Day they will often find an ancient rite that fits into that time of year and do that. It would be absurd to use Irish words in a Greek rite. And the same goes for all our cultures. We call on Nature Spirits but not the Sidhe, necessarily, and believe me, it’s not all sweetness and light. We don’t use pentacles, although some people will use crystals for healing. But yes, we do raise energy for magical purposes occasionally, and much of our Order of Ritual is magical in nature, but that’s another question. KS – In forming ADF, Isaac Bonewits took a strong stance against Wiccan-influenced and generic modern Paganism, yet the organization now includes a wide range of religions from a great variety of parent cultures. At this point, how is ADF fundamentally different from eclectic Neo-Paganism? KT – We are held together by our common Order of Ritual. Certain steps, based in IE concepts, take place in a certain order. An ADF member visiting a grove [ritual worship group] far from home will know exactly what is going on in the ritual, even if the culture being honored is different from their own. KS – Is there any formal relationship between ADF and other Druid organizations around the world? Have you yourself participated in rituals or otherwise interacted with members of these groups? KT – Not really. Some of us know each other and interact on a personal basis, but nothing formal. KS – One of the most striking classical accounts of Druidry is the description by Tacitus (c. 56-115 CE) of female druids on Anglesey “raising their hands to the sky and shouting dreadful curses” that terrified and paralyzed the invading Roman soldiers. What percentage of ADF Druids would you estimate are women? How has ADF worked to promote women in clergy and other leadership roles? KT – I’d guess that women outnumber men in ADF. In the clergy, there are nineteen female members and sixteen male. I’d say we’re promoting women pretty well. KS – The association of Germanic polytheism with racism has long been something that mainstream practitioners of Ásatrú and Heathenry have struggled against. Modern practitioners of Celtic religions also have to deal with the appropriation of elements of their root culture for racist nationalist ends. Although your own work focuses on comparative Indo-European work, ADF discourages the mixing of deities from different parent cultures in a given rite. Does this reinforce ideas of racial and cultural essentialism and go against the idea of Indo-European connections? How did you deal with issues of identity, race, and religion in your capacity as ADF Archdruid? KT – I have always been quite adamant that racism has no place in ADF. And most of us worship the gods and spirits of multiple cultures. My personal work is in Irish, Welsh, Gaulish, Norse, and Hellenic cultures. While some stick to only one or two cultures – Irish and Norse are a popular pair – it’s hard to say no when a god or goddess approaches you and wants your attention. I don’t think racial and cultural essentialism is an issue for us at this time. KS – Isaac Bonewits was raised Catholic and briefly attended “a high school seminary for kids, sort of like a prep school for future priests.” When asked why he remained a Druid, he replied, “I have a ‘vocation’ to be a Druid, using the Catholic terminology, since I don’t know any Celtic terminology to describe the same thing.” After reading this, I began to look at the idea of ADF as a Druid Catholic Church – to examine the extent to which the organization is built on a Catholic model. Please excuse my lengthy excursus, but I’ve been thinking a lot about this issue – not just in Druidry, but throughout the wider world of modern polytheism. From its inception, ADF moved away from the small group structure and private rituals of Wiccan covens to focus on larger public rituals. Bonewits spoke of Wiccan leader “Gerald Gardner’s efforts to create what amounted to a Pagan house church movement” closer to the practice of early Christians; ADF instead focused on “liturgical work… mostly based on medium-to large-group liturgy,” which sounds more like the ritual practice developed by the Catholic Church. When Bonewits says, “I believe that modern-day Druids… have the ability to bring people together from many different origins and help them to learn how to work together to contact the Gods,” it sounds like he views ADF in a very Catholic – or at least catholic – sense. 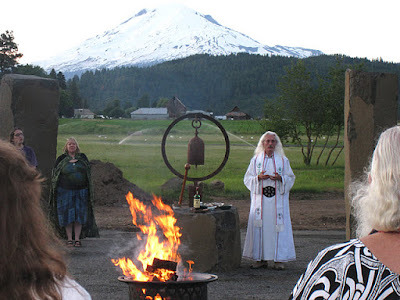 Interestingly, practitioners of American Ásatrú tend to have private rituals within a local kindred structure, while their Icelandic counterparts hold larger public rites within a national structure. The American system is clearly based on Wiccan practice, turning covens into mostly independent kindreds and the Wheel of the Year into a variety of circular calendars with various mixtures of Norse, German, and English names for reconstructed and invented holidays. In contrast, the Icelandic system is built on a national clergy system with a specified calendar of celebrations and rites of passage quite close to those of the Evangelical Lutheran Church, the National Church of Iceland. 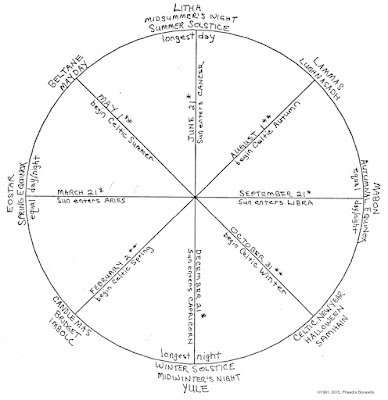 ADF seems to follow the Icelanders in partially modeling structure and practice on a large Christian system, including the requirement that ADF groves required hold public rituals on the “High Days” of a generic Neo-Pagan Wheel of the Year. Like the Icelanders, ADF focuses on a structure with a single leader at the top of the organization and a practice of public, large group ritual. While the Icelanders follow the model of a national Lutheran church, ADF turns to the international model of Catholicism. A core idea of ADF is its prescribed ritual form. According to Bonewits, “The primary advantage to having a standard liturgical outline is that you don’t have to reinvent the wheel every time it’s time to do a ritual, and people from various parts of your organization who are traveling through your territory can participate and know more or less what’s going to happen.” This idea has been put to use through all the “Kins” of ADF – Vedic, Germanic, Hellenic, Slavic, etc. Your own scholarly work has focused on similarities of belief and practice across the ancient Indo-European world, but ADF practice seems to again turn to the model of the Catholic Church, where a practitioner can find a church anywhere in the world, walk in, and expect a locally flavored variation on the same liturgical model. Theologically, ADF places great emphasis on triads. This can be tied to Celtic ideas, but it seems to be used in a way quite close to Catholic doctrine. The Three Kindreds honored with ritual are ancestors, deities, and nature spirits, which are somewhat analogous to the Father, the Son, and the Holy Ghost. The Three Realms of Reality are the Heavens, Underworld, and this world – closer to Heaven, Hell, and this world of ours than to the Norse idea of nine worlds or the Celtic concept of the Otherworld intersecting with our own like a parallel plane of reality. Even when ADF overtly distinguishes itself from Christianity with the Doctrine of Archdruidic Fallibility, it is noteworthy that the distinction is made in opposition to specifically Catholic dogma. The ritual garb you yourself wear while officiating looks very much like the vestments of a Catholic priest. However, some of your own statements seem to lean towards a Protestant outlook. “It is my belief that ADF Priests are primarily ritual specialists,” you have written. “While priests lead groups of the People in making sacrifices, acting as the face of the People towards the Kindreds [ancestors, deities, nature spirits], anyone, with experience and practice, can experience the Kindreds on their own.” This sounds more like Martin Luther than the pope. So, there you have my overlong analysis! I’m very curious to know your thoughts on this. Did the Catholic background of Bonewits lead to a hardwiring of Catholic structure and theology into ADF? In turning away from Wiccan influence, has ADF embraced a Catholic one? I don’t mean in a parodic sense of a pope on a throne dispensing dogma, but in the way that the Catholic church actually works – a central leader and standard ritual, a core set of beliefs and practices, flexibility in local churches to address the needs and concerns of their own parish, and the other elements that I’ve addressed. KT – I expect that Isaac did model us, at first, on the Catholic one. It’s what he knew. But we’ve moved far beyond that. Yes, we have an Archdruid, who is only first among equals. He has one vote on the Mother Grove and can be – and often is – outvoted. In no way could the President of the Corporation of ADF be compared to the pope. I expect that our rejection of the Catholic idea of the pope speaking ex cathedra – in that the Archdruid is fallible – was a reaction to the accusation made by others back in the day. As for theology, we couldn’t be more different. Catholicism is about submission to the will of God. And no one can access God without the intervention of a priest. We have none of that nonsense. We form relationships. We do not grovel. There is no idea of original sin – nor of grace, for that matter. We’re just fine the way we are and need no saving. As for our ritual order, it is just that – a list of steps to be taken. The words are up to the celebrants. While there are certain tropes that have become popular that you may hear coming from different mouths, our rituals are as different as the people performing them. There is no set text, only a series of set steps – and these have pretty wide latitude as well. As for triads, yes, the Christians stole a lot from the Irish. But our triadic models are functionally equal. Upper, middle, and lower worlds are metaphors only, a way of expressing an idea of the cosmos. The Irish horizontal version still equates – land is the midworld, sea is the underworld, and sky is the upper world. The Norse nine worlds also fit into this, with three worlds equating to each of the basic ADF three worlds. You may be overthinking the comparisons. Modern people have been trained to want congregations and religious leaders. In ancient times, the entire city or tribe would come together for ritual, but we don’t have that luxury any more. We in ADF are a collection of local tribes, if you will, bound together in a larger tribe. And that’s what the standardization – what little we have – is for: to hold us together. KS – There is a very fierce debate raging between Indian Hindus and American academics over the ways in which Hinduism is studied and taught in the United States. In a very broad sense, the dispute can be summed up as Hindus believing that the voices of actual Indian practitioners are denigrated in American academia, and American academics believing that their scholarly training gives them a deeper understanding of the Indian religious traditions than Indians themselves have. I have spoken to passionate people on both sides of the aisle, and the animus can sometimes be quite intense. Throughout your book, your examples from India are centered on Vedic religion of the earliest recorded period, not from modern Hinduism. Unlike continental Europe, the British Isles, and the Nordic countries – the root lands of the various forms of modern Paganism – India never underwent a major conversion to Christianity, and Christians only make up 2.3% of the population today. Indian religion has undergone many major changes from the Vedic period through the varieties of today’s Hinduism, yet there is a rich living tradition with Indo-European roots stretching back 3,500 years. The early Vedic texts are definitely closer to Celtic and Norse traditions than today’s Hindu teachings, but it seems that Hinduism provides a model of what other paganisms could have developed into if not for the Christian conversions. All of this raises several questions. Are there Hindus from India or of Indian background in the Vedic wing of ADF, or is it comprised of European-Americans practicing their own academically based versions of Indian religion? KT – We are starting where the ancient religions left off. Hinduism is it’s own religion. As I tell people, if you want to be a Hindu, go be a Hindu. ADF doesn’t need to reimagine something that already exists. The changes in Vedic religion that occurred by the time of classical Hinduism, including the splitting off of Buddhism and Jainism, were profound. Sacrifice was replaced by puja. Even the gods changed. Major Hindu gods – such as Shiva, Vishnu, and Brahma – are hardly mentioned in the Rig Veda and were very minor gods. 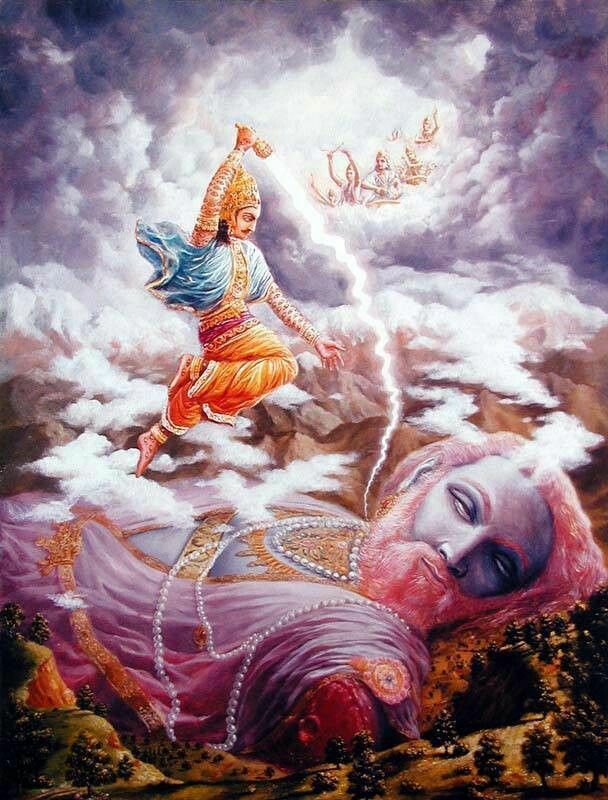 Great Vedic gods – such as Indra – became much less important and even became demonized in some minds. This is why we say ADF is based on pre-Christian, pre-Hindu, and pre-Zoroastrian ideas. I have no idea if we have any Hindus of Indian background in ADF. We do have a western scholar studying in India who has been very helpful for the Eastern Kin. KS – Modern Hindus practice a living religion that has evolved over the centuries from an early Indo-European polytheism and did not have to be revived after being eradicated. If the central goal of ADF is to rebuild and strengthen living Indo-European religions, wouldn’t it make sense to work with Hindus and learn from their religious insights? KT – Not really. Modern Hinduism is as different from ancient Vedic religion as modern Christianity is from the tiny churches that existed before Constantine. It’s interesting, perhaps, but why bother? To favor Hinduism would force us to favor Christianity, as well, and that sort of defeats our purpose. KS – We discussed ADF’s prescribed ritual earlier. Although there are fascinating similarities between various Indo-European religions, there are real and profound differences in belief and ritual. Aside from adding “local color” to the standard ritual – using culture-specific deity names, for example – how do you address the major temporal, spatial, cultural, theological, and ritual differences between the religions? 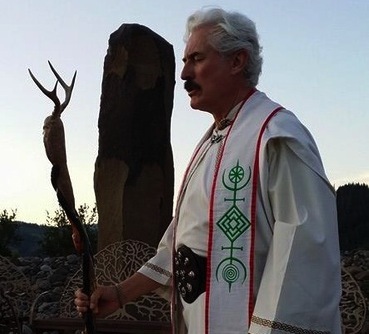 Do you view the Norse, Celtic, Slavic, Vedic, and other polytheistic traditions under the ADF banner as separate and distinct religions, or are they all “denominations” of one overarching religion? KT – Since we follow our own Order of Ritual, this transcends all those differences you mention above. ADF is Indo-European religion, so all the various cultures you mention would be denominations, I suppose, rather than different religions. Remember, we’re not trying to recreate ancient religion. We are reimagining it for modern people. There’s a big difference there. KS – Discussion of Indo-European theory is largely verboten in much of academia today, due to its connection with racialist thinking before and during the Third Reich. Historian of religions Bruce Lincoln once insisted to me that all the major scholars in the field were fascists, war criminals, or both. However, many modern Pagans still embrace the older scholarship. ADF is fundamentally built around a comparative Indo-European approach, as is your book. How do you respond to scholars in the academy who view any such work with intense suspicion? KT – Yes, and Bruce Lincoln is a socialist. Ha! So all of them need to be taken with a grain of salt. ADF used to accept Dumézil’s tripartite theory, but it’s so obviously flawed that we’ve pretty much dropped it now. We do still value Eliade and his theories of the sacred and profane, the center and the border, but I honestly don’t see any racialist attitudes in his work. And we also value Mr. Lincoln. He’s in my book as well. We just take the best and leave the rest. 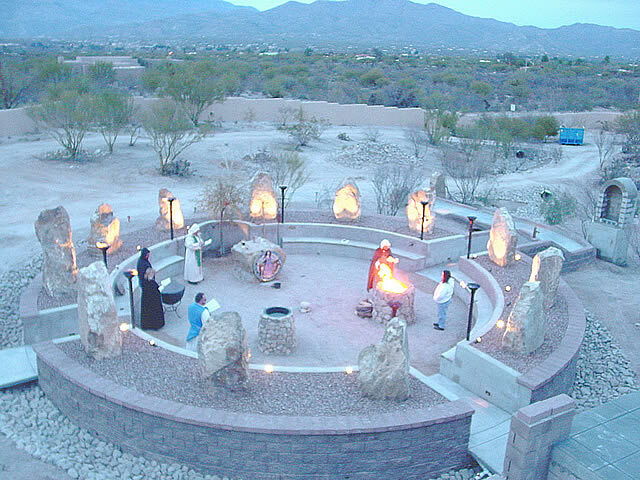 KS – You’ve built two stone circles for ritual use, one used in the past by the Sonoran Sunrise Grove in Tuscon and one currently used as part of the White Mountain Temple Complex in Trout Lake, Washington. Do you have a different interpretation of the Nemeton? KT – You are right that Nemeton usually means a sacred grove. However, in Gaul, these groves also gained small temples inside them, usually by Roman times. So for me, a Nemeton can also be a sacred temple. In Tucson, I was confronted with a desert. Trees are very difficult to grow, and a grove would take forever and would also take a lot of care. So, I went with a stone circle instead. The circle design I’ve used in both places is more akin to the pre-Indo-European stone circles of the British and Irish megalithic eras. I admit this. There is some evidence that the last phase of Stonehenge was built by Indo-Europeans, but that doesn’t really help. The earlier designs were more egalitarian, where anyone could sit on the ditch bank and watch what went on inside – think Avebury – while at Stonehenge it would be far more difficult, so that elite rituals could take place inside in private. I’m not proud of this. But I believe that the great stones soak up and store energy, making the place juicy, which I like. This is just my own UPG [unverified personal gnosis], of course. 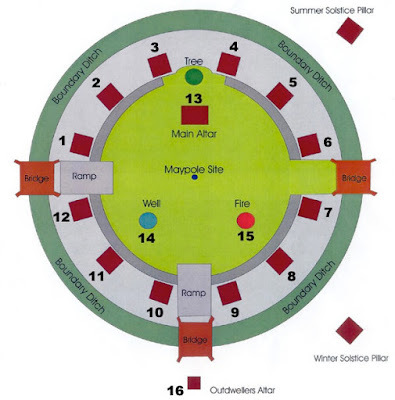 KS – Since ADF is so clearly centered on Indo-European practice, I’m also curious why you base your ritual space on megalithic stone circles, which long pre-date the arrival of Celtic peoples in what we now consider Celtic lands. Stonehenge, the most famous example, was built over a period of time around 2500 BCE and likely in ruins by 1000 BCE – before any evidence of people speaking what we now call Celtic languages appear in the area. Furthermore, there is no archaeological evidence for the use of Stonehenge in the Celtic period. However, the image of Druids performing rituals at Stonehenge has been hard-wired into the popular imagination since the English antiquarian John Aubrey suggested in 1659 that the monument was set up as a Druid temple by the Celts. More recently, this connection has been famously embraced by Athur Uther Pendragon of the Council of British Druid Orders, a regular fixture at the summer solstice rituals held each year at Stonehenge. What’s your view on the connection between the stone circles (ancient and modern) and Druidry (ancient and modern)? KT – I believe I answered much of this in the previous question. And I don’t think there is any connection. Stone circles are just cool. Ha! KS – The two ritual complexes you built are impressively massive, and required professional engineers, construction crews, and heavy machinery to build. They include pavement, paving stones, and concrete poured over metal receiving rods. The second complex includes a sanctuary originally constructed by the previous property owner to be a Judeo-Buddhist retreat house. The structure now has running water, electric power, artificial lighting, and a heating system installed. The ritual area includes a plastic-lined Sacred Well and a stone-lined fire pit for offerings. The entire complex is truly amazing and extremely impressive. Mount Adams and the rest of the natural setting that serves as a backdrop is magnificent, but the constructed space seems constructed in a post-industrial sense. 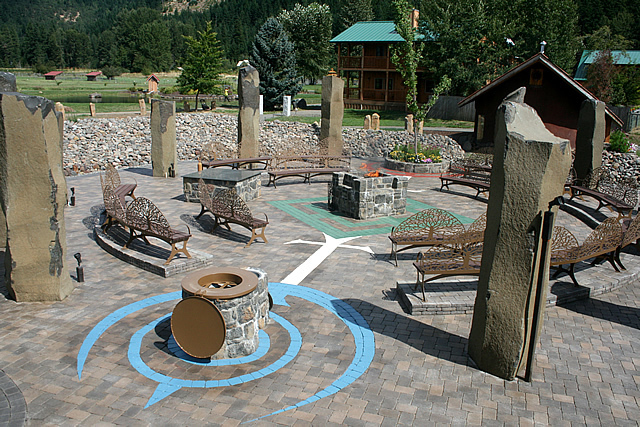 At first, I struggled to reconcile the concept of you have called a “nature religion” with these engineered spaces, and I wondered about the spiritual and psychological results of moving a sacred space from forest grove to manufactured complex. Then I started to think about the massive temples of the ancient Greeks and Romans and the unbelievably ornate temples of ancient and modern India. Maybe the Celts practicing in the forest were simply at an earlier stage of Indo-European development and would have eventually built mid-sized buildings like the Nordic hofs before moving on to larger and more sophisticated temples like those of the other cultures. What was your thought process when designing your sacred spaces? Were you trying to imagine what the physical structures of Druidic religion would have developed into in the modern age, if not for the destruction of the old Celtic religions? KT – We live in the modern world. People won’t come if it’s too uncomfortable, hence the benches and paving. We get up to five feet of snow per year – this year was bad – and no one likes mud. Also, I wanted to include the Cosmos Sigil in the floor, to help tie in the well, fire, and tree – the axis mundi pillar. The entire circle is aligned on the pole star over Mount Adams, as well. I believe that had the ancient Gauls and Druids been left alone they would have turned their oppida into cities, and the primitive temples – such as the stone ones at Entremont – might have spread throughout Gaul. Yes, the idea of using stone for a temple might have come from the nearby Greek colony of Massalia, but ideas spread, anyway. They would not have built stone circles, though, like I did. That time had passed. KS – I’ve read of your plans to build Trout Lake Abbey as a “cultural complex to include the entire Indo-European spectrum,” and I’ve found information about it being a “joint venture to create both a Druidic and a Buddhist monastery on the same property.” You’ve also referred to it as an “ADF monastery and seminary.” How have your plans progressed at this point, and what are the current goals for the project? KT – Actually, once I became Archdruid everything came to a stop. I’ve not made any plans to date, I fear. Now that I’m no longer in that position, I hope to begin working on this seriously soon.